Visit SaveDobbins.org for the latest information on our fight to save the island, including signing the Friends of Dobbins Island petition! Another lawsuit heard in late 2009 is still awaiting a decision. MRA contends that the placement of a fence on the beach at the island is improper based on the Mean Low Tide requirement of Maryland law. 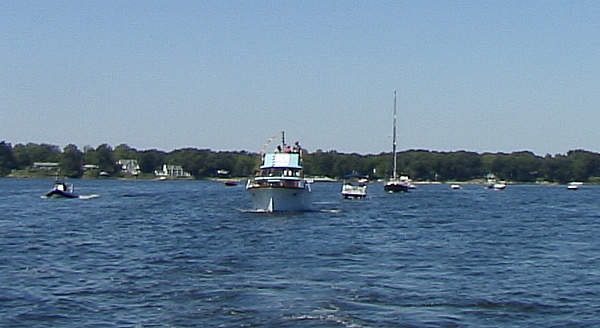 The suit also asks for a prescriptive easement (similar to adverse possession law) based on continued public use of the island for more than 50 years. The fight to save Dobbins Island from development is ongoing. How it will play out—either in the court system or via an outright purchase—is still very unclear. Read our FAQs for background. 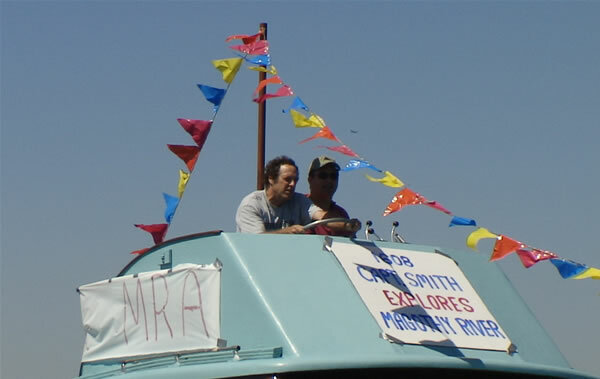 To show public support against island development, MRA organized a boat parade to the island on Saturday, September 1, 2007. 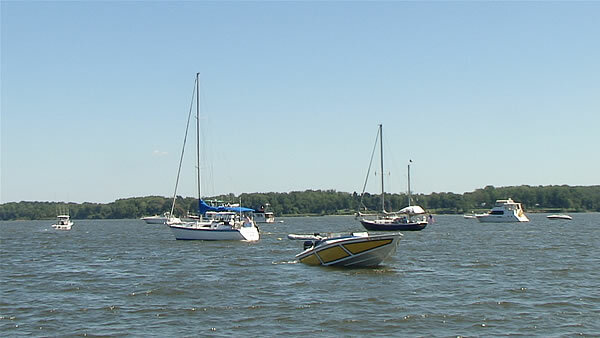 The purpose of the parade was to rally support of the horde of boaters that routinely use the beautiful spot as an anchorage—an anchorage that will be prohibited if the island is developed. Answer: In September 1999, the Anne Arundel County Office of Planning and Zoning and Critical Area Commision wrote an internal memo (view PDFs page 1 page 2) pointing out to 15 issues the developers needed to address surrounding critical area restrictions to the proposed development of the Dobbins Estate on Dobbins Island and Little Dobbins Island. all vehicular accesses are to be located outside the 100-foot and expanded buffers. If it is chosen to put these areas within buffer areas, a variance will be required prior to plat approval. a forest conservation easement will be required to be recorded prior to plat approval. If all the issues noted had been followed, controversy surrounding Little Dobbins Island and now Dobbins Island would never have occurred. If this raises questions in your mind about the effectiveness of the County’s Office of Planning and Zoning, please call the County Executive, John Leopold, at 410-222-7000 to voice your concerns. Why wasn’t the island taken as a donation when it was offered? Answer: LET ME MAKE THIS CLEAR, Dobbins Island was never offered to the Magothy River Association. This is folklore! What is true is back in the mid 1990’s the Magothy River Land Trust (MLT) and State Delegate Joan Cadden worked out a deal with the Dobbins family to buy Dobbins Island, Little Island, and a few acres on the mainland for $750,000. I believe this was to become part of Cadden’s Magothy River Green Way, an open space park. While MLT was negotiating and raising the money, another party offered the Dobbins family about $500,000 cash with no waiting; the family took the money. Important Note: MLT has been effective in buying property for conservation and when they lost Dobbins Island they moved forward with the next project and raised over $4.5 million to buy another large piece of property in Pasadena on the Magothy: the Looper property. When the new owner tried to sub-divide the Dobbins property, he ran into real trouble with critical area laws. In fact, according to a 1999 County memo, the County told the new owner that both islands are completely within the critical area buffer where all development is restricted unless he obtains a variance (see above). As near as we can tell, and this too may be urban myth or folk lore, a deal was proposed that if the County would give him seven buildable lots then he would give Dobbins Island away for $1. This story cannot be verified. What we know for sure is that the Magothy River Association was NEVER offered the island for $1 nor was MRA President Paul Spadaro personally offered the property for $1. Why wasn’t the Magothy River Association up in arms and questioning the building permits when the house on Little Island was being built. Where were you? Answer: Since 1946 the Magothy River Association has closely monitored land-use and permit/variance processing. Unfortunately, over the years MRA has lost members whose expertise focused on planning and zoning issues. When Paul Spadaro became president, he decided to redirect our efforts to match the ability and interests of our volunteers. As a result, when Little Island was being built, the Magothy River Association was saving the Magothy River by building five oyster reefs, restoring underwater grass, and dealing with numerous other issues that affect the quality of life in the watershed. Ok, if you have to blame someone, with limited resources at the time, MRA volunteers dropped the ball and we have learned from our mistakes. This fall the MRA will have a new program called Creek Watchers, which will become MRA’s eyes and ears of the watershed. But, who is truly responsible for monitoring the land-use of Little Island? Anne Arundel County. The County’s paid staff in the original 1999 memo had already determined and alerted the new owner that both islands were within the critical area where building was RESTRICTED. If the County had followed its own recommendations in their 1999 memo, there would be no controversy surrounding Little Island and Dobbins Island. According to the 1999 memo all the variances on either island had to be approved PRIOR to the original subdivision approval. Why are we talking about variances on Dobbins Island and Little Island in 2007 when it appears to have never been a legal subdivision in the first place? The County knew that something was happening with both islands! In fact, the county sent building inspectors out to Little Island to inspect the rip rap. NO variances and NO public hearings. Curious? If Dobbins Island is made into a park, will it be owned by the County or the State? If Dobbins Island is purchased, will it be left to erode away like it has been doing for 50 years or will something be done to actually stop the erosion? 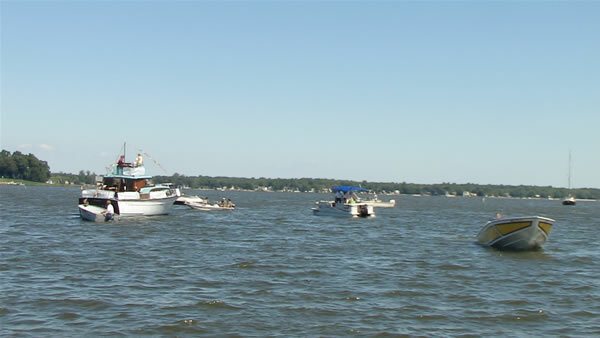 Answer: Clearly, past island owners have done little to stop the island from eroding. Left in private hands, there are no guarantees that any island owner now or in the future will ever maintain the erosion controls. 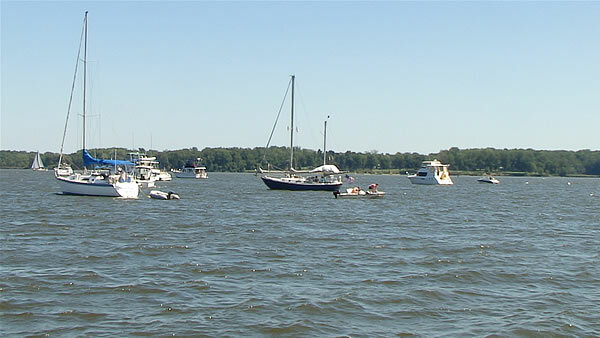 However, once the island gets into public hands, then the Army Corps of Engineers can be recruited to use federal dollars to stabilize and maintain the island. Why is there little mention in the press of the 600-foot no anchorage zone once electric lines are laid to Dobbins Island? Answer: Probably because inexperienced reporters have done most of the reporting. 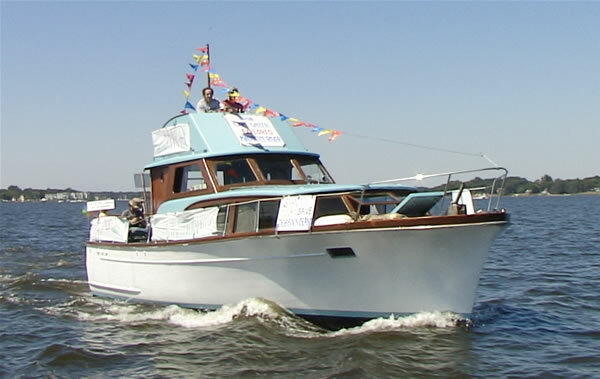 These reporters are not boaters and have no clue about the impact of development on the island or the impact an electrical cable will have on the anchorage. Once an electric cable is run from the mainland to the island, 300 feet on either side of the cable will be restricted as a no-anchorage site. Explain the “truce” and why the island owner put up a pier? He has been actively moving forward and no one seems to be able to stop him. Answer: TRUCE!? 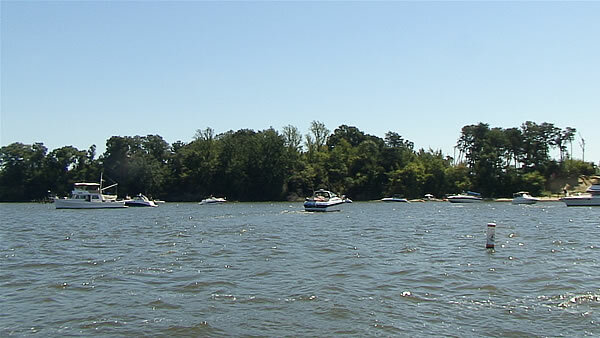 The island owner came to MRA president Paul Spadaro last Spring and suggested if MRA gave up the beach lawsuit over the mean high water line and beach access then he would consider selling the island. What he didn’t say was that he was already ordering lumber to build a pier. “I am sorry but the construction of the pier is my fault; I trusted this gentleman,” said Paul. But the good news is that we can restart the beach lawsuit anytime. It is clear that a lawsuit is a concern to him. He knows a lawsuit focusing on mean high water could tie him up in court for many years. However, through the truce negotiations Paul made a “promise to him” that the MRA would work hard to find a solution, and this is what we have been doing. Since receiving interest from the Capt. John Smith Chesapeake National Historic Trail there are now two national land trusts interested in working out a deal with the island owner.